I came across this really cool course blog called The Politics of Fashion, which is a class offered by the Gender and Women's Studies Department at the University of Illinois, Urbana-Champaign. This course is taught by Mimi Thi Nguyen, co-author of Threadbared (a favorite blog of mine). In Nancy J. Parezo’s “The Indian Fashion Show,” we learn that Douglas designed the Indian Fashion Show “to promote interracial understanding” (Parezo, 245). Douglas was able to accomplish this as he provided women with “new images of themselves as Indian princesses” and legitimized that image in the Indian Fashion Show (Parezo, 262). Similarly to Douglas, many fashion directors try to present images of white women wearing attire that is not necessarily associated with American or European fashion in order to convince audiences that these images are “new, unique, and desirable” (Parezo, 263). This notion is certainly manifested by the fashion directors working for Forever 21. The Forever 21 website, which allows customers to browse through all of the clothes and make purchases online, features mostly (if not only) white models. Naturally, all of the models on the Forever 21 website are also tall, thin, and pretty. This specific look of the Forever 21 models affirms the assertion that the fashion industry endeavors to provide white women with images of themselves wearing the clothing that the company is trying to sell in order to increase profits. Even though most American women’s appearance does not resemble that of the models’ on the Forever 21 website, the fashion directors at Forever 21 still appear to be fashioning national bodies. In essence, the fashion industry knows that despite this noticeable discrepancy in looks between American women and the models of Forever 21,many American women will still view images of these models as “new images of themselves” in different clothing. The fashion industry understands that women will then want to buy the clothes the models are wearing because the images are “new, unique, and desirable.” Some of the models on the Forever 21 website are modeling “tribal” clothing, or clothing that is typically associated with a particular culture or ethnicity. This further demonstrates how fashion directors at Forever 21 are fashioning national bodies. -Do you agree that Forever 21’s featuring of mostly white models is a way of fashioning national bodies? -What are other reasons that Forever 21 features mainly white models? 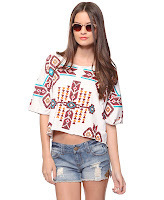 -What do you think about the current tribal trend? -What is the main purpose of Forever 21’s fashioning of national bodies? Is it pure economic interest or something more significant? Hegemony conceptualizes the process of taking culturally constructed ideals and presenting them as self-evident and natural. This process is constantly occurring in our society as a means of defining normalcy. In the reading by Nancy Perezo, Indian fashion shows are discussed. These shows were created by museologists in the 1930′s in order to bridge gaps between perceptions of modern fashion and “primitive” dress. 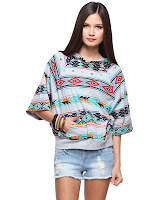 This was done by enumerating the similarities and differences between authentic Native American clothing and the high fashion clothing coming from Europe. This led to a fashion trend of appropriating the cultural dress of a certain ethnic group and commodifying it to sell back to white upper class women. Unfortunately, this is a trend that still continues today. In an article entitled, “Pocahontas Pretty” on the fashion website Trendhunter, mostly white women are shown wearing high fashion depictions of Native American clothing. Pictures like this, place images of Native American culture in a context where they can be appropriated by upper class white women so that they may play “dress up”. This can become especially harmful when the images buy into essentialist categories of Native American identity that are not necessarily based on truth but instead stem from harmful stereotyping. Appropriating the culture of a group of people dehumanizes them, and turns them into a commodity that can be bought and sold. In a climate where violence against these groups is still occurring, the question must be asked, what is the impact of commodifying a culture based on prevailing conceptions of these people? Does it trivialize a culture or even justify hate and violence? Dr. Douglas, creator of the Indian Fashion Shows, believed that by showing white women that they could understand and enjoy Native American dress, he would be promoting genuine understanding between racial groups. Is this thought process still present today when “hipster” designers create a feather headdress to sell at Urban Outfitters? Whether you view them as an homage or as insulting, the reality is that these items of clothing allow people to play with pieces of cultural significance in ways that would be unacceptable if the group was not already marginalized in American society. For example, some of the clothing is inspired from the headdresses worn by Chiefs or Shamans. These figures are extremely important in Native American culture. What if other cultures began to appropriate white Christian culture in the same way? What if clothing inspired by the Pope’s robes became the height of fashion? I know! and think of the potentially destructive influence that these representations have on Native female youth-! I'm not even sure that the argument "What if cultural appropriation happened to them" can be made. Most of my Caucasian friends have no real culture beyond what the television and their parents tell them. If they have no cultural bond beyond 65 or 70 years, how would they understand? My best friend is English/Irish. His parent's don't speak Gaelic. I'd wager his grandparents or great grandparents didn't either. Majority culture is a copy of a copy, especially in America. We have the burden of education, since clearly the fashion industry can't be counted on to do any research whatsoever. I wish that I could wear a pope hat and incite any sort of reaction to make a point. I feel, however, that the probable reaction would be slight envy by a group of flannel wearing, Forever 21-glasses-wearing masses. Can't shame the shameless. Thank you for sharing this information! It is very insightful. I looked at the images on the "pocahontas pretty" page and I am very shocked at how the fashion industry is conveying the Native look, especially with hypersexualization. I recently found the Native Max magazine and am happy to see that Native Americans are represented :).